Beautiful Impressionist painting by Paul Sawyier called RIVER FRIENDS painted between 1908 and 1913 on the Kentucky River. Sawyier (1865-1917) was born the son of a physician in Madison County, Ohio, but his family relocated to Frankfort, Kentucky when he was young. Paul's early inclinations towards art were cultivated by his parents, and in 1884, Sawyier enrolled in the Cincinnati Art School. Within two years, he had opened a studio in Cincinnati. After a stint in New York (studying under William Merritt Chase at the Art Students League), Sawyier returned to Cincinnati and studied under Frank Duveneck. Sawyier then returned to Frankfort and local subjects became his focus, and it was then that he developed his particular aptitude for watercolors. 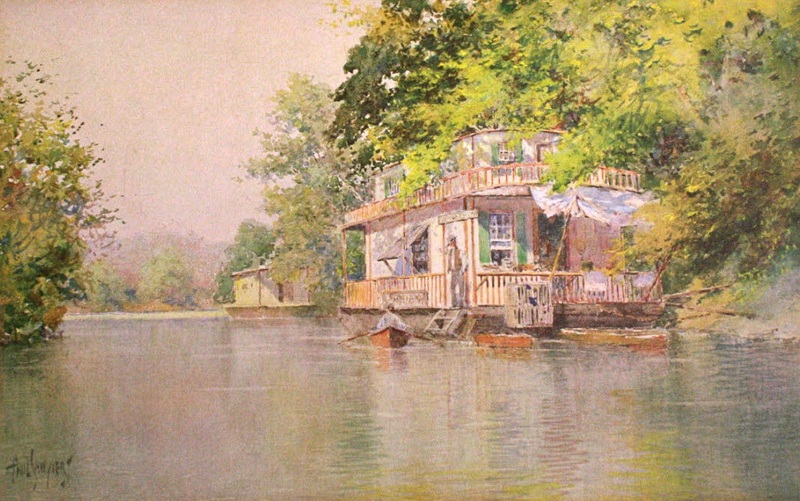 Between 1908 and 1913, Sawyier spent several years living on a houseboat on the Kentucky River painting his surroundings. It was at the 1893 Columbian Exposition that saw Sawyier and his work achieve some level of popularity, and it was there that he, unlike most of his Kentucky contemporaries, embraced Impressionism. Being very proud of his status as a professional artist, Sawyier generally refused to engage in other pursuits even when money was short (which it often was). In 1913, Sawyier relocated to Brooklyn, New York; there he lived with his widowed sister. A couple years later, he moved to the Catskill Mountains where he died in 1917. Second Beautiful Impressionist painting by Paul Sawyier called RIVER RIDES painted between 1908 and 1913 on the Kentucky River. Associated Press wire photo of a fisherman standing in his skiff with a small net on the end of a pole and above his shantyboat he suspended a large fishing net suspended from an improvised constructed in part from a rough tree branch resting in and "X" yoke braced on the roof of the shantyboat. 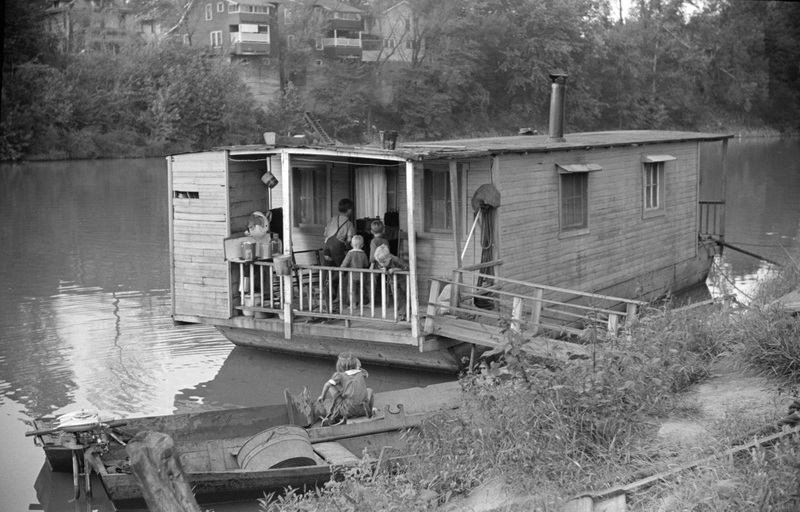 A typical houseboat dweller on the Mississippi River, one of thousands of Depression-created itinerants of the waterways. They fish and plant "garden patch" along the river banks in the summer and float South with the ducks in the Fall. Many of these wanderers have large families." 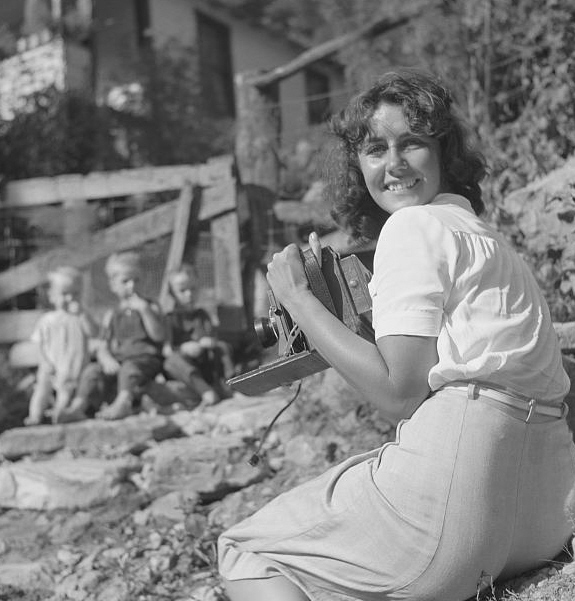 Here are some beautiful shantyboat photos from the Library of Congress plus a public domain portrait of the photographer Marion Post Wolcott taken in Kentucky in 1940. 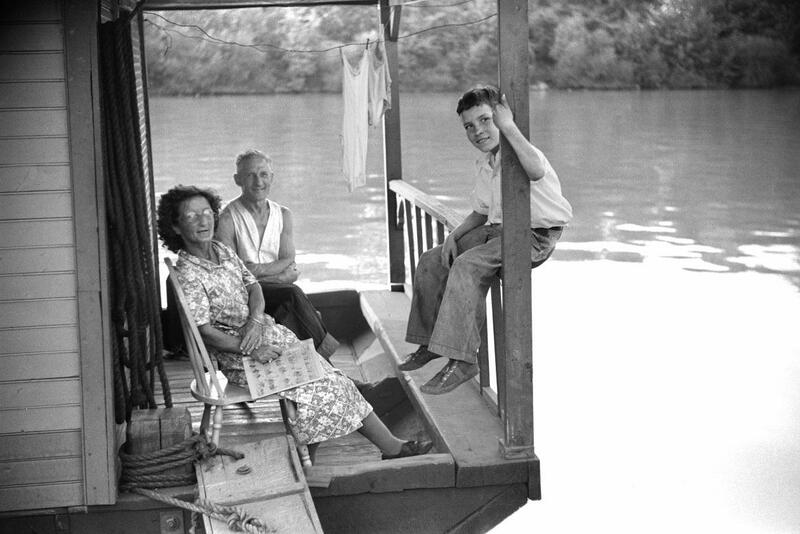 The lives of shantyboat folks on the Kanawha River at Charleston, West Virginia were captured by Marion Post Wolcott with a 35mm camera in September 1938. Marion Post (June 7, 1910 - November 24, 1990), later Marion Post Wolcott, was a noted American photographer who worked for the Farm Security Administration during the Great Depression documenting poverty and deprivation.Marion Post was born in New Jersey on June 7, 1910. Her parents split up and she was sent to boarding school, spending time at home with her mother in Greenwich Village when not at school. Here she met many artists and musicians and became interested in dance. She studied at The New School. While in Vienna she saw some of the Nazi attacks on the Jewish population and was horrified. Soon she and her sister had to return to America for safety. She went back to teaching but also continued her photography and became involved in the anti-fascist movement. At the New York Photo League she met Ralph Steiner and Paul Strand who encouraged her. When she found that the Philadelphia Evening Bulletin kept sending her to do "ladies' stories," Ralph Steiner took her portfolio to show Roy Stryker, head of the Farm Security Administration, and Paul Strand wrote a letter of recommendation. Stryker was impressed by her work and hired her immediately. Post's photographs for the FSA often explore the political aspects of poverty and deprivation. They also often find humor in the situations she encountered. In 1941 she met Leon Oliver Wolcott, deputy director of war relations for the U. S. Department of Agriculture under Franklin Roosevelt. They married, and she continued her assignments for the FSA, but resigned shortly thereafter in February 1942. She found it difficult to fit in her photography around raising a family and a great deal of traveling and living overseas. In the 1970s, a renewed interest in Wolcott's images among scholars rekindled her own interest in photography. In 1978, Wolcott mounted her first solo exhibition in California, and by the 1980s the Smithsonian and the Metropolitan Museum of Art began to collect her photographs. The first monograph on her work was published in 1983. She was an advocate for women's rights; in 1986, Wolcott said: "Women have come a long way, but not far enough. . . . Speak with your images from your heart and soul" (Women in Photography Conference, Syracuse, N.Y.). Attached page of 8 photos on page 232 illustrating THE SHANTY-BOAT PEOPLE by Charles Buxton Going from an 1895 issue (no month or other precise date available) and only one short column of text on page 231 transcribed below. Hopefully the rest of the article will turn up one of these days. 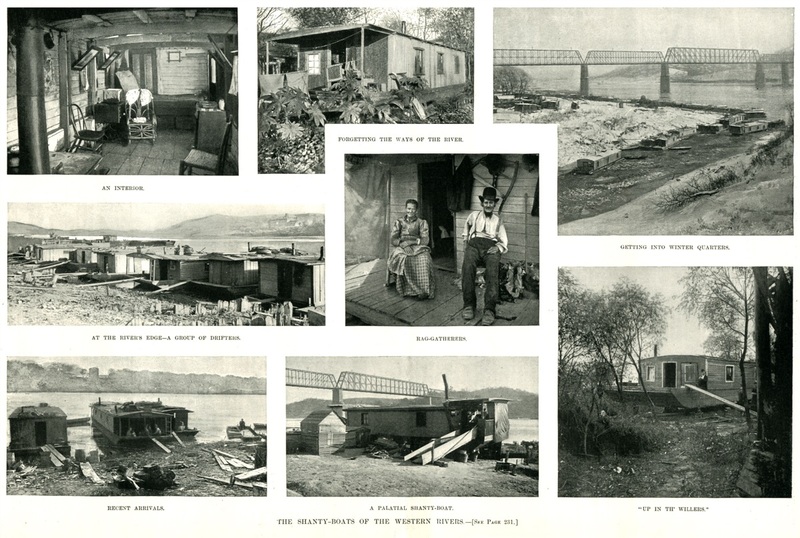 Interesting images of Shanty boats and folks including one interior view. The caption "FORGETTING THE WAYS OF THE RIVER" must refer to when that shanty boat was beached when the river receded, leaving the floating home high and dry until the river rises and sets the craft afloat again. Between high and low water, mark of the Western rivers—and that means a wide range in those erratic streams— is a stretch which might well be termed " No Man's Land." For months in winter and spring it is, indeed, no land at all, for the boiling yellow waters roll over it; as they fall, foot by foot the slope of oozy clay appears, bristling here and there with a stubble of naked willow shoots, and littered with.drift left by the receding current. The water has hardly fallen away, however, before little green things begin to come up; first, cockle-burs, ragweed and water-hemp, then bur-marigolds and morning-glories; followed by wild sunflowers, which nod in the river winds, and fling out their long yellow-rays with all the grace of golden lilies; finally, if the season be long enough, these give way to a wealth of brisk little asters. All enjoy their life estate; if the river remain low, but all are regarded by the capricious stream as mere squatters, to be driven out at will, and its notice of ejectment is a summary drowning. Nature takes the chances of such a residence freely, but man will generally hesitate, and the more substantial his interests, the less he will entrust them upon so uncertain a tenure; yet the river-bank has its human fauna as characteristic as its flora. These are the shanty-boat people, the gypsies of the river, and if their domain be limited literally to the river "bottoms," it extends in length from the Gulf to headwaters, where the shallow stream ripples over its rocky floor. Hidden from their fellow-men by the edge of the steep bank, out of sight and out of mind of the busy world above, they drift silently from town to town and slip irresponsibly from State to State . . . 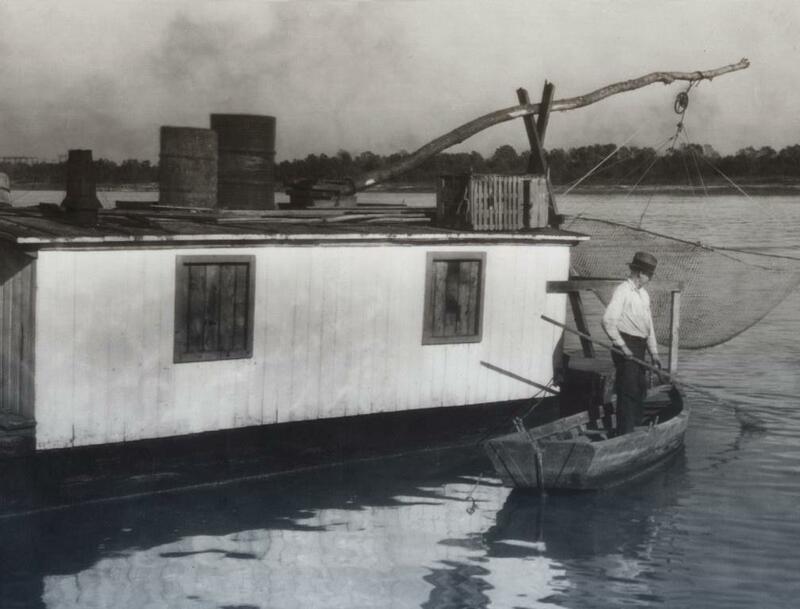 He owned a shanty boat on the east end of Louisville's Towhead Island in the early 1900's. For part of the year, Bush worked at a factory and for the remainder of the year, he'd shell mussels. Nearby factories would buy the shells and turn them into pearl buttons. Bush was atypical for two reasons: he was an African-American living in Louisville's mostly White shanty boat community, and because of the length of time he lived in the area—18-20 years. In that stretch of time, most boat dwellers eventually drifted to other cities for work. 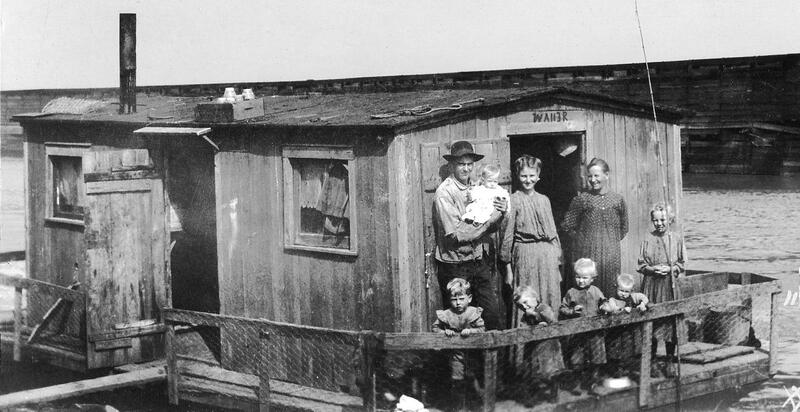 Shanty boats were a popular form of housing in the region from the 1850's to the 1950's. 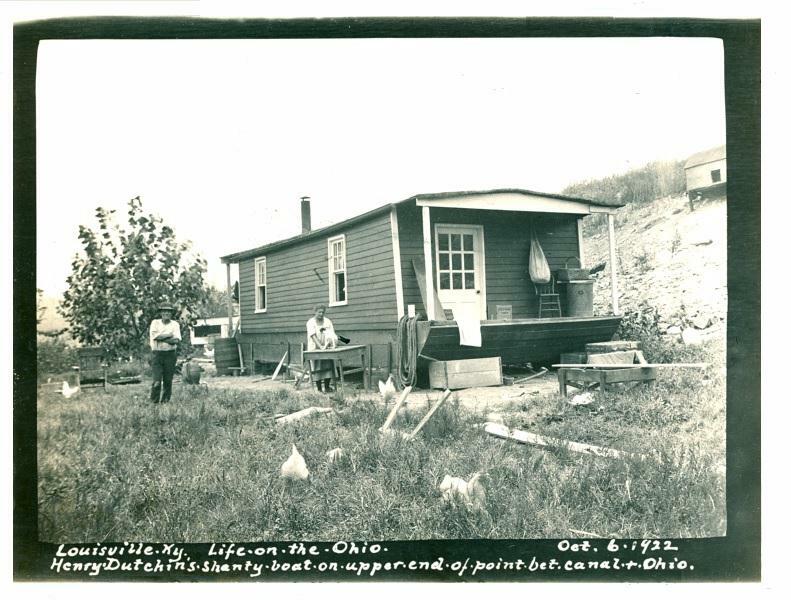 During that time, Bush was one of 50,000 people who lived on a shanty boat and called the Ohio and Mississippi Rivers home. "The actual peak time—they were beginning to trail off in the Post World War II period—was the Great Depression," said Mark Wetherington, senior research fellow at the Filson Historical Society. Wetherington recently led a talk at the Filson about shanty boats and what he calls "Louisville's lost neighborhood." For $30-40, you could buy yourself a shanty boat. These boats were similar in design to shotgun houses. If you wanted a fancy one, it could cost you about $200. And it wasn't just fishermen who lived on shanty boats. Other workers—servants, stone masons, and basket makers—wanted in on them, too. "Most of them had two rooms, some had three," Wetherington said. 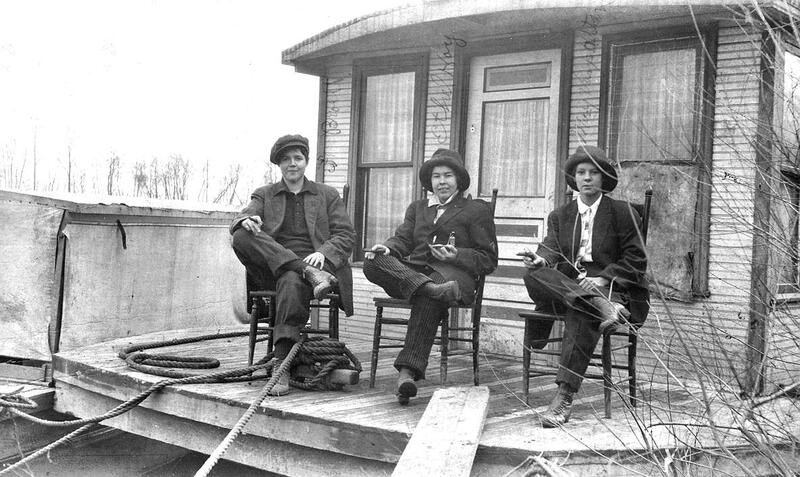 It was a better deal than living in one room with several other families in Louisville's notorious tenement houses. The city's population doubled between the years 1870 and 1910 and housing couldn't keep up. For $5 a month you could get a room in a tenement house. Shanty boats, however, offered more space. Shanty boat communities were stereotyped as being full of shiftless men who enjoyed a drink too often. 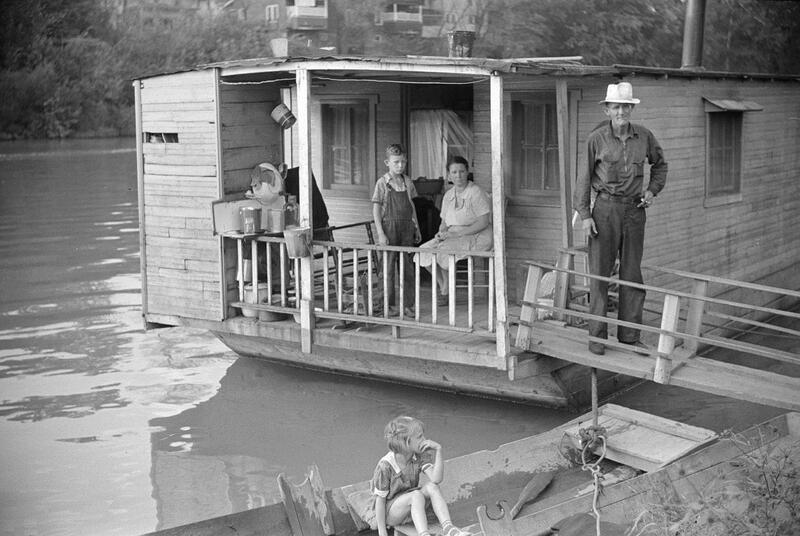 But about half of Louisville's shanty boat community were women and children, said Wetherington. Women had jobs as fishers, too. They, along with men, also made fishing nets and baskets for a living. Children were merchants and sold those products in the streets. Wetherington said the shanty boat community had an underground economy where many bartered for what they needed—including a new boat. This was helpful for growing families that had outsized their one-bedroom homes. By the 1950's and 60's, the shanty boat community disappeared. Several circumstances led to the demise including multiple floods—starting with the 1937 flood—and pollution of the Ohio River. "The flood of 1937 and another flood in the 40's convinced people in Louisville that they really needed to shut this area down because it was uninhabitable," said Wetherington. The 85 acres of Louisville's Waterfront Park today consists of fountains, greenery, and art for residents looking for respite from the city. But Wetherington wants Louisvillians to remember this significant part of the city's history. "The waterfront is where Louisville started," he said. "We've gone back to it. We've re-embraced it with the waterfront redevelopment." "Some of that deals with public health, some of that deals with the quality of housing, some of it deals with our air quality," he said. Roxanne Scott covers the economy for WFPL News. 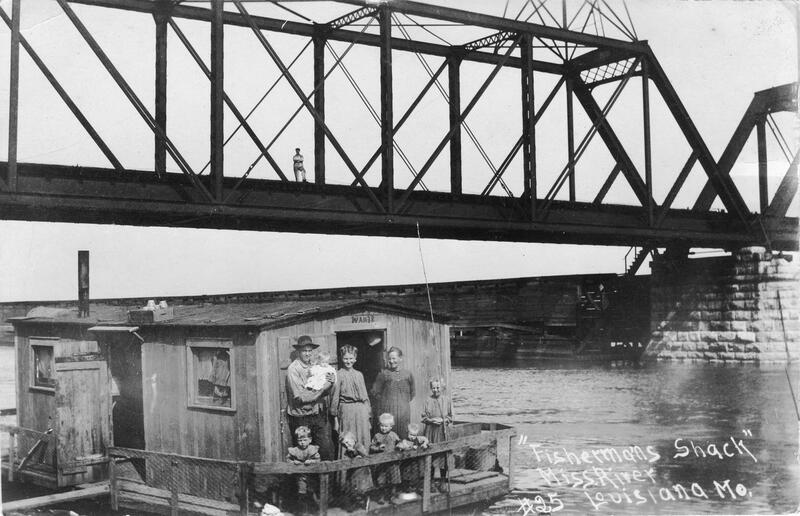 A fisherman and his family aboard their tiny shanty boat on the Mississippi below the RR bridge at Louisiana, MO (first big town south of Hannibal). Post marked Oct 29th 1914 by the Louisiana, MO post office. "Would have pictured the entire family - but the other six members were asleep in the spare room and I did not like to disturb them." The town of Louisiana may have issued licenses to these small craft . . . above the door behind Mama are the letters and numbers WA113R. Cliff Edwards (voice of Jiminy Cricket) was from upriver in Hannibal where his father was a fisherman. 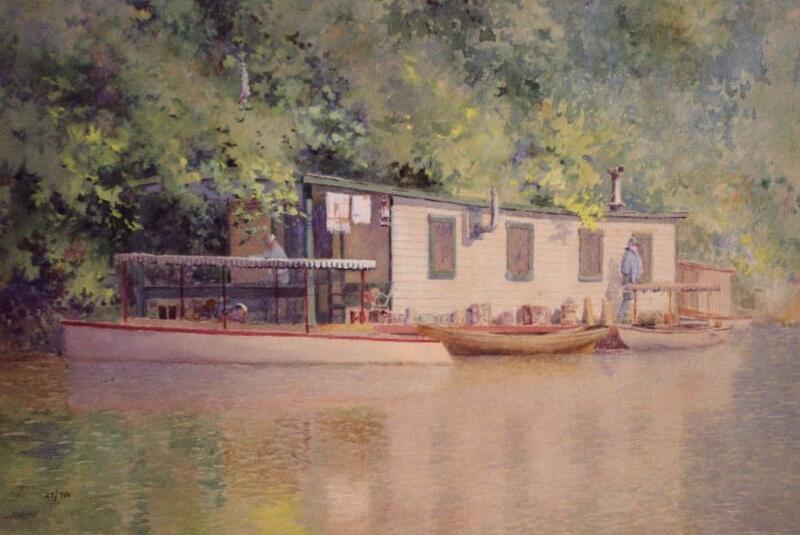 Some of the Edwards clan may have lived aboard a shanty boat like this at some point while living along the river. According to one historian I knew in Hannibal, the father of Cliff Edwards was fishing in his "waders" in the shallows near the Missouri shore where he fell into a "sink hole" not visible under the opaque river water and he was consequently held under by the current and drowned before he could be rescued. "Dangerous waters" on the Mississippi whether along the shore or out in the deep channels.